The first instance in district court is carried out through the ordinary trial procedure (includes the speedy trial procedure; hereinafter the same) while the first instance in summary court can be carried out through either the ordinary trial procedure or the summary trial procedure. After indictment, if deemed necessary in order to conduct productive trial proceedings in a consecutive, systematic, and speedy manner, cases can be brought to the pretrial conference procedure. This enables the issues and evidence of the case to be arranged prior to the first initial trial date. The Act on Participation of Saiban-ins in Criminal Trials (Act No. 63 of 2004; hereinafter referred to as the “Saiban-in Act”) defines that cases covered by Saiban-in trials (refers to criminal trials with the participation of Saiban-ins (lay judges); hereinafter the same) shall be all subject to the pretrial conference procedure. In addition, cases may also be brought to the interim conference procedure, in which the issues and evidence of the case can be arranged in the same procedure as the pretrial conference procedure after the first initial trial date, if the court deems it necessary in light of the progress of a trial. Table 2-3-1-2 shows the number of persons in cases brought to pretrial conference procedure and interim conference procedure in district courts by type of offense in 2008. Table 2-3-1-3 shows the number of persons finally disposed in district courts and family courts in 2008, by type of offense and judgment. 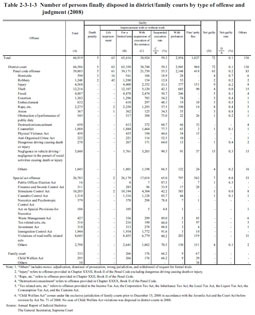 Table 2-3-1-4 shows the number of persons finally disposed (through either the ordinary trial procedure or summary trial procedure) in summary courts in the same year by type of offense. Of persons finally disposed in district courts, the number of those for theft was the largest with 12,216 (18.3%), followed by Stimulants Control Act violations with 10,205 (15.2%), violations of road traffic related acts with 8,645 (12.9%), and negligence when driving a vehicle / negligence in the pursuit of social activities causing death or injury at 5,848 (8.7%). Among persons finally disposed through ordinary trial procedure in summary courts, 94.2% (7,914 persons) of those sentenced to imprisonment with work were for theft. 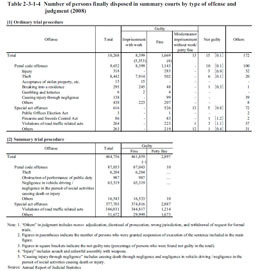 Among those sentenced to fine, theft also accounted for the largest proportion at 30.1% (502 persons), followed by injury at 17.0% (283 persons) and violation of road traffic related acts at 13.4% (223 persons). Of persons sentenced to fine or petty fine through summary trial procedure, 74.5% (346,031 persons) were for violations of road traffic related acts and 13.6% (63,319 persons) were for negligence in vehicle driving / negligence in the pursuit of social activities causing death or injury. The number of persons sentenced to fine through summary trial procedure was 6,204 for theft and that for obstruction of performance of public duty was 987. Table 2-3-1-5 shows the number of persons in cases brought to speedy trial procedure in district courts and summary courts by type of offense in 2008. The number of persons in cases for which a decision for a speedy trial procedure was revoked due to retraction of a statement of guilt or consent for the speedy trial procedure was 34 in district courts and one in a summary court.